Features 20 watt remote mounted solar panel with 15 feet of shielded wiring and low profile mounting brackets. 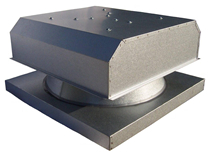 Unit comes standard with self-flashing corrosion resistant zincalume alloy vent housing, ultra-quiet 14 inch fan, thermal switch, and rodent guard. Attic fan is rated for 1350 CFM maximum airflow and can effectively ventilate an attic space of up to 1950 sq ft. Unit ships with unpainted finish that can be customized to match your home's outside decor. Features 25 watt remote mounted high-efficiency solar panel with 15 feet of shielded wiring and low profile mounting brackets. Unit comes standard with self-flashing corrosion resistant zincalume alloy vent housing, ultra-quiet 14 inch fan, thermal switch, and rodent guard. Attic fan is rated for 1550 CFM maximum airflow and can effectively ventilate an attic space of up to 2300 sq ft. Unit ships with unpainted finish that can be customized to match your home's outside decor. Features 20 watt remote mounted solar panel with 15 feet of shielded wiring and low profile mounting brackets. 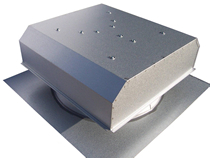 Unit comes standard with curb-mounted flashing corrosion resistant zincalume alloy vent housing, ultra-quiet 14 inch fan, thermal switch, and rodent guard. Attic fan is rated for 1350 CFM maximum airflow and can effectively ventilate an attic space of up to 1950 sq ft. Unit ships with unpainted finish that can be customized to match your home's outside decor.